Please join an online rally to protest the current Australian Government’s attempt to delist 74,000ha of Tasmania’s World Heritage Forests. This unprecedented attempt to de-list an intact World Heritage is an attack on World Heritage Sites worldwide. Australians will be rallying in the Tasmanian capital of Hobart to protest this assault on World Heritage. 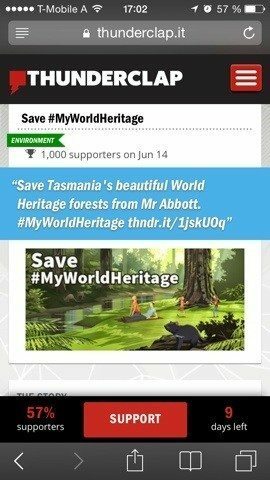 Concurrent to the rally in Hobart, we are hosting an online rally via the platform ‘Thunderclap’ to get the hashtag #MyWorldHeritage trending and show the Australian Government and the World Heritage Committee that the global community won’t stand by and let our World Heritage Sites be trashed. By signing up to Thunderclap with your organisation’s social media account, it allows Thunderclap to Tweet on your behalf at a designated time. This tweet (or Facebook post) will contain the hashtag #myworldheritage in it and some text that is editable. It will post your tweet at the same time as everyone else who signs up to the Thunderclap. By posting all the tweets at the same time it will kickstart trending hashtag on Twitter that will be continued throughout the rally in Tasmania. People will be able to join the conversation and all across the world anyone can click on the hashtag and see the conversation unfolding. We need you to sign up to the Thunderclap here: . We need you to sign up to the Thunderclap before the 14th June, when it will go live. When your organisation Tweets about Australia’s World Heritage forests, can you also use the hashtag #myworldheritage so people in Australia and around the world can join in the conversation. Please continue to tweet throughout the World Heritage Committee meeting in Doha to continue showing your support for World Heritage.